Pilot 111 is a fishing complex situated a short fifty minute journey from Bangkok city centre composed of a series of ten fishing ponds of varying size which have been heavily stocked with Giant Snakehead and a wide variety of other predatory monster fish species. The fishery is a large complex of ten artificially constructed ponds covering several acres which is situated in Ban Pakong on the outskirts of the city of Bangkok. Pilot 111 allows sport fishermen and anglers visiting Bangkok the opportunity to fish for Giant Snakeheads to 6 kg , Striped Snakehead, Barramundi to 12 kg, Featherbacks, Asian Redtail Catfish, Pacu and Mekong Catfish. 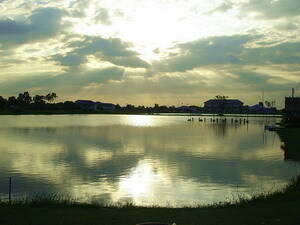 The complex of ponds at pilot 111 is primarily dedicated to predator fishing and lure fishing and with the exception of one pond containing Mekong Catfish, the complex has been stocked exclusively with an impressive selection of ferocious and hard fighting predators with species which are both native and have been introduced to Thailand. The predator ponds vary in size as does the species of fish and predator anglers visiting the ponds can effectively target their preferred choice of freshwater predatory species. The ponds lend themselves to fly fishing and lure angling with wide open banks and unrestricted banks but afford the angler very little respite from the sun. Small wooden shelters or (salas) are located at various points around the ponds allowing the angler to shelter from the sun. Thailand snakehead fishing enthusiasts will be delighted to hear that the ponds have two lakes totally devoted to Snakehead fishing which have been heavily and exclusively stocked with Giant Snakehead and Striped Snakeheads. This venues immediate proximity to Bangkok makes it the closest and most convenient fly casting and lure angling destination to Bangkok. Lure Anglers and fly fishermen visiting Thailand can now fish at the highly prolific ponds by design for Giant Snakehead, Striped Snakeheads and various other freshwater predatory species in Thailand. The ponds offer anglers who are visiting Thailand and Bangkok the opportunity to lure fish and fly fish for Giant Snakehead and various other freshwater predators only a short distance from Bangkok. The various ponds respond well to conventional lure angling techniques with both Rapala and Cultiva lures producing large bags of predators in addition to various fly techniques which also score well with the predators!The complex has an onsite covered restaurant which serves a wide variety of delicious local Thai cuisine with a selection of mouth watering dishes which are prepared each day with fish caught from the adjacent fishing ponds. A bar is also onsite for anglers wishing to celebrate their lure angling success after a hard days angling. This highly prolific angling venue can be visited daily or combined in one of our tailor made angling holidays designed to the clients specific angling requirements.